The longer I garden in the North, the more I love sedum. It starts out as a dainty little cabbage head each spring, grows into a perfect green (or purple) background to summer flowers, and then it flowers up in early to mid fall, going from greenish to pink to russet to brown, depending on the variety. Sedum come in dozens of varieties — tall, short, light green, dark green or purple foliage — and most of them seem to be just as hardy as the rest. 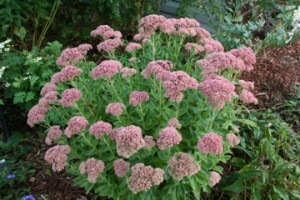 The best known sedum is probably ‘Autumn Joy’, a rock-solid plant that I have grown for almost a decade. I divided mine a couple of years ago and now have several nice clumps, which look like they may need dividing again. The popularity of ‘Autumn Joy has led to the marketing of several of its sports, including ‘Autumn Fire’, which is more compact that ‘Autumn Joy’ and has a deeper red bloom, and ‘Autumn Charm’ and ‘Autumn Delight’, two variegated sedum. Among the more popular sedum now are the purple-leaved ones, such as ‘Black Jack’ and ‘Purple Emperor’. 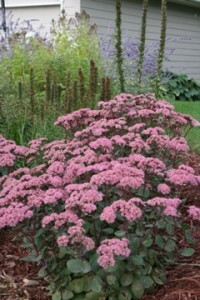 When I created a new front-yard garden a couple of years ago, I debated whether to plant a purple sedum and ended up choosing ‘Matrona’, which has deep purple stems but green leaves. What I really like about this plant is its habit: not too tall, upright, with lots of smallish bloom. Like Autumn Joy, it attracts butterflies and bees galore. More recently, I planted a small sedum (‘Hot Stuff’ — don’t you love plant names) which has almost lime-green foliage and very dainty blooms. 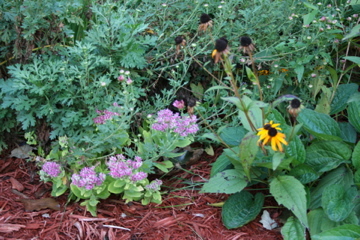 While sedum look good in spring, summer, and fall, what I love most about them is what they add to the winter garden. Leave them standing and soon you will have snow-capped blooms that add an element of shape, texture, and fun to the garden. What are your favorite sedums? « A Bloom from Beyond? Hi Mary; I *think* I have a Matrona. I inherited it from a friend, who didn’t know the name of it. Mine sounds like the one you describe, but in addition to the purple stems, it has purple/wine colored veining in the leaves. I LOVE it (and so do the bees)! I like the creeping sedums almost as much as the upright ones. And, the one I use as a companion in the bed with the possible Matrona is Dragon’s Blood. It gets cute pink flowers on the wine colored leaves. Purple Emperor is my most recent favorite. I absolutely adore sedums, they’re such a great option for poor soils, and when they’re blooming, I get more bees covering them than the rest of my garden, they really go for them. I love all the sedums, upright and creeping. Way to hard to pick a favorite. My newest sedum this year is called October Daphne. It looks great next to my grasses. Right now the Autum Joy and Autum Fire (? to wet to go look) are blooming now. I have had blooms on all my sedums all season long. The bees love them!